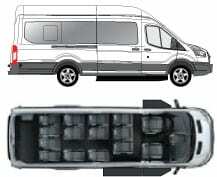 CommTrans sells 8, 10, 12 and 15 passenger Ford Transit hotel passenger vans with our ShuttleStar upfit package created just for the hotel industry. We have stock inventory on site for a fast turn-around, or we can order a van with additional options to fit your needs. 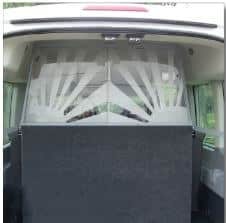 Our ShuttleStar hotel van upfit package includes 10″ deep steel running boards, luggage wall with emergency exit to meet FMVSS, lighted ID sign and hotel graphics wrap. 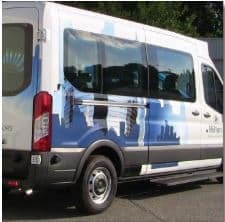 CommTrans offers a turnkey solution to make the purchasing process easy, and delivers the van nationwide to your door with graphics, ready to go! 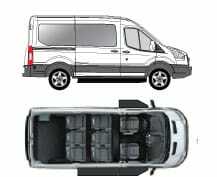 Go to the Van Deliveries page to see photos of our ShuttleStar vans ready to be delivered. 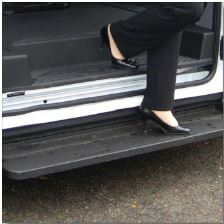 Offer a safer entry and exit for your guests with our full 10” deep steel step at driver, front, and side passenger entry. 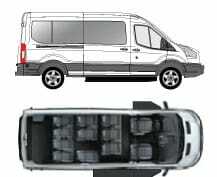 Secures luggage with a sliding emergency exit that meets FMVSS. Extends to ceiling to help with climate control. Stay visible with our custom illuminated sign. 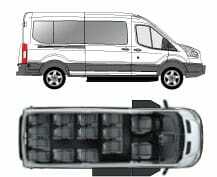 Promotes brand identity and meets airport guidelines. 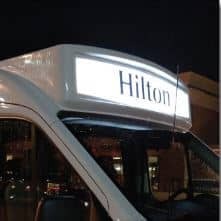 SignWorks is a preferred vendor for hotel brands, and will keep you in compliance with your corporate standards.